As Paste pointed out three weeks ago in its review of Infinity #1, blockbuster comic events, much like any other narrative, succeed when they inspire the reader to ask what’s next. It’s a simple concept, though easier said than done. This introduction to X-Men: Battle of the Atom does many, many things right, but the above qualification isn’t necessarily one of them. The 10-chapter event it begins, quarantined to the core X-books with two signature bookends, doesn’t offer a simple hook, either. A respectful Spoiler Alert from here on out. 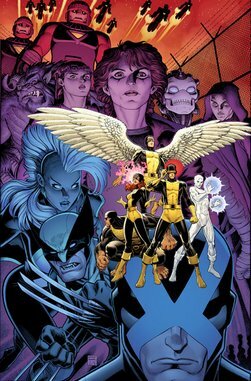 Within these pages, the classic teen Golden Age X-Men have time traveled to the present, where they mingle with future versions of themselves, speak all manner of antiquated lingo, and generally show what an innocent, sparkling wonderland the ‘60s were before the advent of variant covers and Cinnabon. After entering a near-fatal ambush with members of the modern-day X-Men, Marvel Girl, Cyclops, Angel, Beast, and Iceman realize that their chronological shenanigans may create some reality-wrinkling problems, but would rather stick around their new dystopian home out of sheer altruism. And then some surprise alternative-dimension guests say hello in one of those touted last pages that would warp any 14-year-old’s mind. These threads ultimately form a question mark where a bold exclamation point should be. Rather than igniting the conflict of previous storyarcs to a boil — again, see Jonathan Hickman’s man-o-war megastory between Avengers, New Avengers, and Infinity — writer Brian Michael Bendis opts for further exposition and leisurely banter. No impossible stakes threaten immediate doom. No grand villain activates a chessboard death trap. This comic spotlights a problem that’s existed for more than a year in All-New X-Men, while more dimension-hopping characters mount a mass grave overflowing with similar past concepts, lest we forget the Chinese X-Men, The Age of X, or even Bendis’ last event. For a property inspired by the African-American Civil Rights Movement, Battle of the Atom wants to entertain more than breach questions of metaphorical equality. And that’s no crime. Bendis is a charming, comfortable scribe who choreographs popcorn fight sequences with dragon-conjuring bombshells and cinematic timing. And he’ll also make you laugh. The author’s take on Iceman’s libido and mischief making is especially endearing. (“A full-blown mutant food fight! You don’t want to see that?”) Artist Frank Cho’s intricate figures and lavish battle scenes are pretty damn spectacular, too. One shot of Kitty Pryde plunging through the air with a katana reinforces the fact that grownups dressed in yellow unitards fighting monsters will never, ever be passé. While this introduction (and it is just an introduction) may not light its panels on fire or keep you up at night, there are far worse ways to spend $3.99 and fifteen minutes.